Craig Sillitoe has been a staff photographer on The Age and Sunday Age newspapers in Melbourne Australia for over 15 years. Currently on The Sunday Age, he says the weekly newspaper provides a wide span of photography challenges, from portraits to studio, products to sport, news & features. PHOTOGRAPHER: It was the week before ANZAC day, when Australians honour our veteran soldiers and those lost in wars. Our picture editor wanted a moving image of Melbourne’s Shrine of Remembrance to go with interviews of veterans. I could spend as long as I liked, which is code for ‘don’t come back without a good shot’. In the foreground of the picture is the Eternal Flame. PHOTGRILL: Why did you shoot through the flames? PHOTOGRAPHER: I spent a long while just roaming the grounds around the Shrine, shooting some pictures of the scene and people. It’s a very moving place, but I wasn’t getting an image that summed it up for me. It had to have passion, but this scene was almost serene. I lost myself staring for a long while into the Eternal Flame before realising the flame itself was the picture I needed. PHOTOGRILL: Did you need to use any hacks? 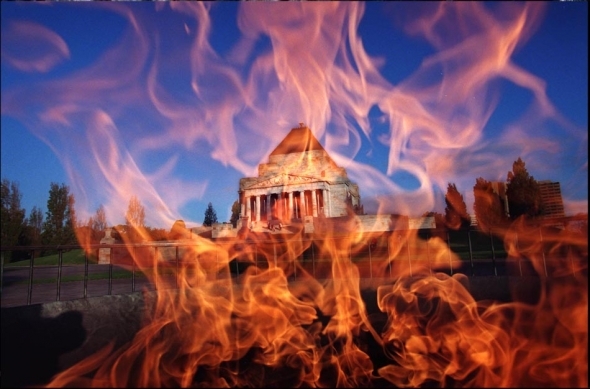 PHOTOGRAPHER: The Eternal Flame sits inside a large cauldron and is surrounded by a waist high fence that lets people be warmed by it, but stops us from getting close enough to be burnt. From that distance I could get a photo looking through the flame with a 70mm lens. But that would compress the image of the Shrine so that a small part of it would fill the background. I wanted to see the distinctive outline and the trees surrounding it. A 20mm lens would be more suitable, but it would have to be very close to the Flame. I wasn’t going to jump the fence, that would be disrespectful, and I’d get burnt. So I went back to the car and made a hack. PHOTOGRAPHER: The camera would be mounted on a mono-pod, but it would have to be bent horizontally at 90 degrees, otherwise it would point at the sky. 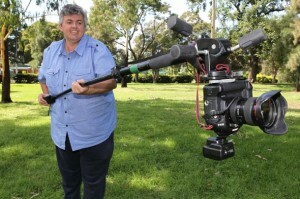 So a tilt/pan tripod head was mounted on top of the mono-pod, then the camera was attached. 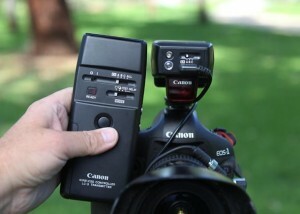 With the mono-pod extended horizontally about five feet, I could hold the camera out in front of me. With flames moving and flowing, it would be too slow to set the camera’s self-timer to take pictures. That’d mean pulling the camera back after each exposure and pressing the shutter button again, and not being able to react to changes in the flames. So an infra-red remote trigger was attached to the camera and the remote control was gaffer taped to the end of the mono-pod so it could be fired by my right hand whilst holding the hack at the same time. Another way to do it would be with a wire remote wrapped along the mono-pod, but I wrecked mine when I tried to extend it to 20metres. PHOTOGRILL: What was it like to operate? PHOTOGRAPHER: Shooting with a wide-angle lens this way is easier than it sounds. If you move a telephoto lens a degree the wrong way then you’ve lost your subject from the viewfinder. But wide-angle lenses are very forgiving and they have plenty of depth of field, so focus is less critical. The hack was a bit heavy when extended out. I tried anchoring my end of the mono-pod on the top rail of the fence for support. That didn’t work because the flames move around a lot, and resting the mono-pod stopped me from pulling the camera back out of the flames (just as well it’s black). PHOTOGRILL: What settings were on the camera? PHOTOGRAPHER: The camera had to be pre-focused, with plenty of depth of field, f16, so the flames would be sharp even up close. At the same time a fast shutter speed was required, 500th/second, to stop the flames. So 400 ISO was needed on a sunny day. Interestingly I also got some pictures while there was cloud cover which didn’t work at all. Without a nice crisp sunlit scene behind the flames the scene appeared flat and muddy and the flames were also less defined and with less depth of colour. 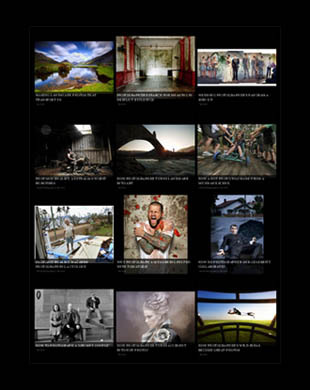 Vote to grill more of Craig Sillitoe’s images at Portfolio. This entry was posted on Friday, February 25th, 2011 at 10:09 am. It is filed under Fairfax Photographers, The Grill and tagged with Creative Photography, Photographic Techniques, Posts Tagged ‘Landmark Photo’. You can follow any responses to this entry through the RSS 2.0 feed. @photogrill http://twitpic.com/45xxa6 – Wow, what an amazing shot!!! I would have risked melting my camera for that shot. Ouch! Glad it survived. “@photogrill: How I nearly burnt my #camera making this #photo. Just as well it’s black. @photogrill Awesome work and outcome!! 1. How did you add the flames because the flames could of burnt the camera? 2. How did you get this photo to look so awesome? I wish I could do photos like you do. I should signed up for the photography elective at school, anyways, bye!!!!!!!!!! You’re vey welcome and thanks for commenting, it’s always nice to get feedback.